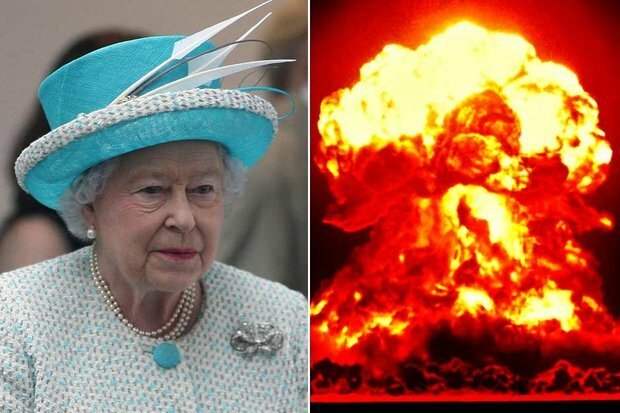 Queen Elizabeth II was expected to urge British people to pray and remain united and resolute in the event of the “madness” of nuclear war, papers from 1983 show. The script for a hypothetical broadcast has the Queen describing the threat to the “brave country” as “greater” than any other in history. It also mentions the Queen’s son Prince Andrew, then in the Royal Navy. The speech, devised by Whitehall officials at one of the most fraught Cold War periods, was never recorded. The document, released by the government under the 30-year rule, was drawn up as part of a war-gaming exercise in the spring of 1983, which worked through potential scenarios. A senior government official had urged Margaret Thatcher to seek out a fertile female panda for London Zoo before a visit to China in 1982. Although it was only a simulation, the text of the Queen’s address – written as if broadcast at midday on Friday 4 March 1983 – seeks to prepare the country for the ordeal of World War III. The script, which starts off by referring to the Queen’s traditional Christmas address, reads: “The horrors of war could not have seemed more remote as my family and I shared our Christmas joy with the growing family of the Commonwealth. “Now, this madness of war is once more spreading through the world and our brave country must again prepare itself to survive against great odds. “I have never forgotten the sorrow and the pride I felt as my sister and I huddled around the nursery wireless set listening to my father’s [George VI’s] inspiring words on that fateful day in 1939 [at the start of the World War II]. “Not for a single moment did I imagine that this solemn and awful duty would one day fall to me. Striking a personal note, the script continues: “My husband and I share with families up and down the land the fear we feel for sons and daughters, husbands and brothers who have left our side to serve their country. “My beloved son Andrew is at this moment in action with his unit and we pray continually for his safety and for the safety of all servicemen and women at home and overseas. “It is this close bond of family life that must be our greatest defence against the unknown. The speech concludes by saying the Queen’s message to the nation was “simple”. In the war-gaming exercise, Orange bloc forces – representing the Soviet Union and its Warsaw Pact allies – launch a chemical weapon attack on the UK. Blue forces – representing NATO – retaliate with a “limited-yield” nuclear strike, forcing Orange to initiate a peace process. The exercise came in the year that US President Ronald Reagan both enraged and alarmed Moscow with his denunciation of the Soviet Union as the “evil empire”, his plans for a “Star Wars” ballistic missile shield in space, and the deployment of US nuclear cruise missiles to Europe – including to RAF Greenham Common. Tensions increased when the Soviets shot down a South Korean airliner that strayed into their airspace, killing all 269 on board. A NATO military exercise, codenamed Able Archer, then nearly triggered an actual conflict with the Soviet leadership apparently convinced it was cover for a genuine attack. The Soviet Union and the US later negotiated a reduction in the number of nuclear weapons, as the Cold War came to an end.